...that there are 3 different ways to kill a Hive God? ...that the Last City was once guarded by eight different Towers, but all except two have been destroyed? ...that the Fallen Walker that the House of Exile deploys during Public Events on the Moon is called a "Noble Iron Walker"? ...that the Valkyrie is a unique Relic Weapon created by the Warmind Rasputin? 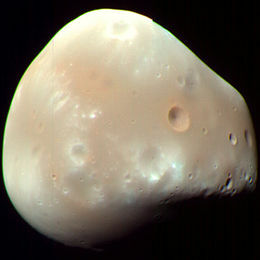 Deimos is the smaller of the two natural satellites of Mars. It can be seen in the sky above Meridian Bay opposite Phobos.